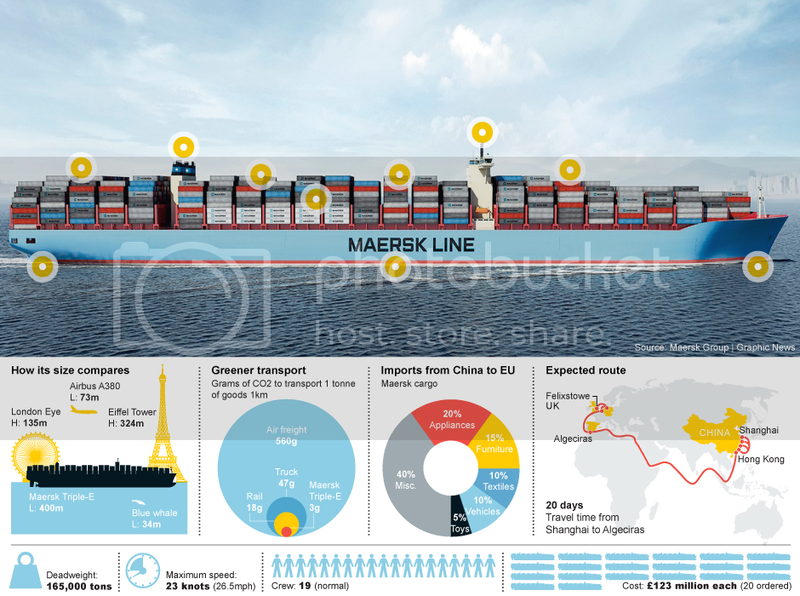 The Maersk Triple E class container ships comprise a family of the largest ships ever built by cargo volume. The name Triple E is derived from the class’s three design principles – economy of scale, energy efficient and environmentally improved. With a beam of 59 metres, they are too wide to cross the Panama Canal, but can transit the Suez Canal when sailing between Europe and Asia. Slower than its predecessors, this class uses a strategy known as slow steaming, which is expected to lower fuel consumption by 37% and carbon dioxide emissions per container by 50%. Maersk has placed an order for a total of 20 Triple-E class ships for around $4 billion. The ship-builder, Daewoo Shipbuilding & Marine Engineering (South Korea) builds three Triple-Es at a time, and it takes little more than a year to produce a ship. Projecting that Chinese exports will continue to grow Maersk plans to use the ships to service the Europe-Asia trade route, which also represents Maersk’s largest market.